The Lenovo IdeaPad U310 isn't the sexiest, sleekest Ultrabook out there, nor is it the most feature-packed. But it does come closer to what we expect an Ultrabook to be: attractive, light, and less than $800. The U310 comes in multiple colors, sports a third-generation Intel processor, and won't break the bank--what more do you need? Our review model, priced at $799 (as of July 11, 2012), sports an Ivy Bridge Core i5-3317U processor, 4GB of RAM, and integrated graphics. It also has a 500GB hard drive and a 32GB solid-state drive for quick boot-up, which is an Ultrabook requirement. In our performance tests, however, the U310 took almost 53 seconds to boot up--that's almost twice as long as the average boot time of the last three ultraportables we tested. 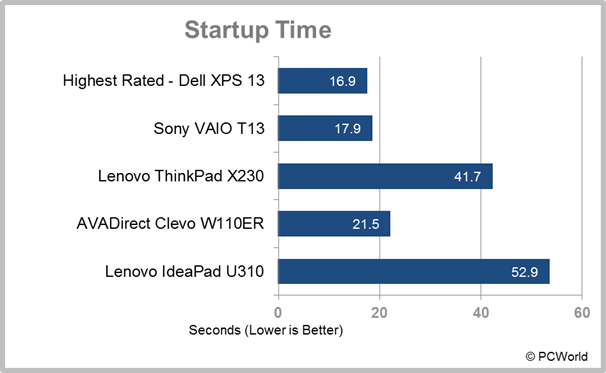 The AVADirect Clevo W110ER, for example, booted up in a mere 21.5 seconds, while the Sony VAIO T13 was ready to go in just 17.9 seconds. Even Lenovo's own ThinkPad X230 booted up in less time, taking 41.7 seconds. The SSD on the U310 seems to be little more than a price-booster. Measuring 0.7 inch thick, the U310 weighs 3.75 pounds and runs the 64-bit version of Windows 7 Home Premium. A score of 94 isn't bad for a machine in the ultraportable category, though the average score of the last three ultraportable laptops we tested was 112.3. In most of our performance tests, the U310 was just slightly slower than the competition: For example, in our image-editing test the U310 took 238.9 seconds to perform tasks that other ultraportables completed in an average of 228.5 seconds. However, on some tasks--audio encoding, for one--the U310 was almost twice as slow compared with the average of other computers in its category. The U310's battery life is just below average--in our tests it managed to survive for 5 hours, 27 minutes. That's a pretty decent result, but considering the size and portability of this laptop, we would have liked to see it run for at least 6 hours. Luckily the included power block is small and light, so toting that around with the Ultrabook wouldn't be a hassle. As you might expect, the IdeaPad U310 isn't a gaming notebook. Like other Ultrabooks and ultraportables, the U310 relies on integrated HD graphics technology, which is fine for viewing high-def video, playing run-of-the-mill MMORPGs, and performing mild graphical tasks, but not so great for enjoying hard-core gaming or working on an intense Photoshop project. Case in point: In our Crysis 2 graphics tests, the U310 barely managed 20 frames per second (low quality settings, 800-by-600-pixel resolution). If you're seeking a laptop that mimics Apple's MacBook Pro (though with a significantly lower price tag), look no further. The Lenovo IdeaPad U310 comes in three color schemes: dark slate gray with a silver-and-black interior, bright aqua blue with a white interior, and cherry-blossom pink with a white interior. Of course, the latter two color schemes greatly reduce the resemblance between the U310 and the MacBook Pro--but our gray, silver, and black review model looks as if it wants nothing more than to be mistaken for Apple's flagship laptop. Don't get me wrong: The IdeaPad U310 is a pretty machine. The cover, made of dark gray aluminum with a soft finish, rounds off at all four edges. A diamond-cut chrome Lenovo logo sits in the upper-left corner. The interior of the U310 is where it gets eerily close to the MacBook Pro's appearance. A medium-thick, shiny black plastic bezel surrounds the U310's glossy screen, giving the illusion of Apple's glass-to-glass, bezel-free design. The wrist-rest area is made of a single sheet of silver aluminum, broken by a recessed black Chiclet-style keyboard, a large glass touchpad, and a small round power button with the power symbol formed by pinprick-size LEDs. The island-style keyboard has matte-black keys with slightly rounded bottoms. Though the keyboard is comfortable to type on, the keys are light to the touch and a little too clicky for my taste. The keyboard also seems a bit flimsy, especially in the middle, where it visibly bends as you type on it. The glass touchpad, on the other hand, is nearly perfect. Smooth, responsive, and very roomy, it has no discrete mouse buttons--instead, the entire touchpad depresses near the bottom. The touchpad supports multitouch gestures such as pinch-to-zoom and two-finger scrolling, all of which were responsive in my tests. 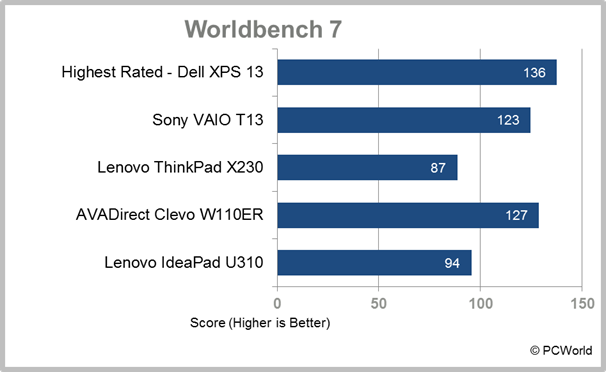 Since the IdeaPad U310 is an Ultrabook, the port selection is modest. On the left side of the laptop, you'll find two USB 3.0 ports, an HDMI-out, and an ethernet connection; on the right side sit one USB 2.0 port and a combination headphone/microphone jack. An SD Card slot resides at the front edge of the computer. The IdeaPad U310 sports a 13.3-inch glossy widescreen display with a native resolution of 1366 by 768 pixels. The screen looks pretty good: Text appears crisp and clear, colors look great, whites are bright (though with a slight grayish tint), and blacks are dark. The screen is glossy but bears an antiglare coating that does a decent job of cutting down reflections. The only real issue I have with the U310's screen is its brightness--or rather, lack thereof. At its brightest setting, the screen is only mildly overwhelming in a darkened room, and is barely visible in bright or direct sunlight. A dim screen isn't as much of an issue if you'll always use the computer in optimal lighting conditions, but this is an ultraportable Ultrabook. The U310's range of viewing angles is also poor--moving just a foot to either side of the computer causes the screen to darken considerably. The IdeaPad U310's speakers are pleasantly loud for an Ultrabook. At the highest volume setting, the speakers can comfortably fill a medium-size room. Audio sounds good, though it becomes a little harsh as the speakers get louder; the bass is clearly present, if a little thin. Lenovo's IdeaPad U310 isn't the best Ultrabook we've seen: It isn't the lightest or the thinnest, it doesn't have the biggest screen or the best battery life, and its copycat MacBook Pro style doesn't make it the most attractive (though I suppose that's arguable). In other words, this Ultrabook is just average. It performs well, as long as you're not looking to do anything fancy. It has loud, if sometimes thin, speakers. It has a good-looking but dim screen. And it has decent, but not great, battery life. At the end of the day, the U310 will most likely appeal to college students and other young, budget-minded shoppers, since it's cheaper than comparably stylish computers and it comes in bright, fun colors. Inexpensive and available in bright colors, the IdeaPad U310 will most likely appeal to college students.